Spring flirted with us this weekend and gave us blue skies and temperatures in the double figures. Incredible! Oh, but wait, it is mid-April. 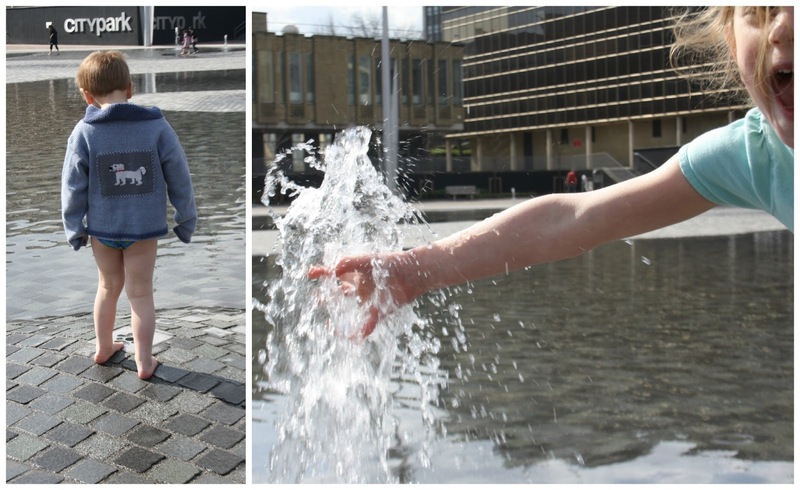 So we made the most of it and visited the fountains with friends yesterday morning. Bella and Angus had a lot of fun paddling (barefoot!) and getting totally soaked. Yes, that is Angus above wearing his only his pants and his cardigan. Everything else had been taken off to stop him getting too wet. I am still touched by how much pleasure children get from playing in water, it is endlessly fascinating to them. All that running around and fresh air meant they were happy to entertain themselves in the afternoon while I embarked on a baking frenzy. I'm not really sure where it came from, I just thought "I need to bake! Right now!" I made two batches of cookies - peanut butter and chocolate, and oatmeal and raisin - tried and tested recipes, easy and tasty. Emboldened by my success, I then decided to brave macarons for the second time. The first time was not what you might call successful. The second time was a total disaster. They didn't rise one bit, were various random shapes, and were much too sticky inside. They looked like little mini pink pancakes, flat and limp. Horrid. Can anyone recommend a good macaron recipe? Obviously I'm blaming the recipe and not my (lack of) skill! Warmer weather turned my thoughts to the garden and to planting some seeds, so I asked the children what they would like to grow, not really expecting much of a response. Bella looked up from what she was doing, thought very carefully and then said "Peas. And tomatoes. And some flowers." Angus requested "Sunflowers that grow very very tall." (They have planted sunflowers at nursery - it is it only flower he is aware of.) So we went to the garden centre, bought the required seeds and planted them. I planted some chilli seeds too but I think I'm a bit late with them. Oh well. However, despite it being the warmest day of the year so far, it was also the windiest, so we did our gardening on the kitchen floor. I made a delicious banana and coffee smoothie for breakfast this morning with all the leftover bananas that come to die in our fridge. Angus will ask for a banana, eat half of it, then discard it somewhere in the house for me to find later. I can't bring myself to throw it away so I put it in the fridge, where it sits for a few days looking sadder and sadder. Smoothies are the answer: banana, milk, espresso powder and little honey or hot chocolate powder to sweeten. Yum. Did you have a nice weekend? Did spring arrive, briefly? I'm sooooo going to try that smoothie recipie. Good luck with the seeds. Looks like a wonderful weekend. I know what you mean about small boys and water. Mine somehow always gets soaked to the skin up to his waist watching his brothers have a swimming lesson. No idea how he manages it. Lucky you with the weather, we've had gales and horizontal rain. I even had to go and retrieve my lantern from my neighbour's garden where it had blown. I cant wait to get started on my first garden this year, but only when it stops looking like an extreme sport...! Good luck with the seedlings and I'll look forward to hearing how they get on. isn't it great that the weather is picking up. looks like a great weekend! Looks like you had a great weekend. Kids and water - they just can't get enough. A good soaking and they laugh out loud but mention the bath and that's a different story, until they're in it and then they don't want to get out! By the way my blog is not updating my posts on followers reading lists - just in case you wanted to stop by! Finally you get some nice weather. Glad you were able to take advantage of it. I've been on a huge smoothly binge lately. They're perfect for using up all those sad bananas. I shudder to think how many I've thrown away through the years. They're such a tricky fruit — green one second then you look away and suddenly they're all spotted and brown. I am thinking of planting sunflowers too. Last year I bought about a dozen varieties of them. The spring is here (+12C! ), but snow is thawing very slowly. Sounds like the perfect weekend. I love a bit of gardening and baking and nice weather! Macarons are tricky I think. I've only tried making them once and it was a dismal failure! What a lovely weekend it was down here in Wiltshire, too. Never tried macaroons, so cant help you there, but I've heard that you should never put bananas in the fridge, so I would recommend take them out of the skin, wrap in clingfilm, and keep in a dark cool (but not cold) place until you're ready to make the smoothies, or you could try banana cake. Wow, Angus is very brave!! We went to the seaside but didn't dare put a toe or finger in the water. The sun was there though, it was soooo nice!! Lovely spring photos. Hoera! Here it was also suddenly much warmer yesterday. I like that fountain photo; it's very funny. Just be careful that they do not catch cold. Coziness is so good for kids (and parents). Sounds like a great weekend! Your biscuits sound so nice! I have never tried making macaroons, I'm too scared to be honest! It's been so lovely to see some sunshine at last, you certainly made the most of it. I think many of us got on with a bit of gardening while we had the chance, I had a mammoth seed sowing session. How wonderful to be able to get out and paddle! The smoothie you made sounds like a fab way of using up bananas. What a lovely weekend! I am really loving smoothies now! I have one for breakfast every morning. Your smoothie looks really yummy! I love those little purple flowers! I bought a few pink Geraniums last weekend and did some planting...it's so nice to have some color by our front door again. Yay for Spring...it's finally here!!! It's been so beautiful hasn't it. So lovely to feel the fresh warm air again and start planting. Looks like you had a wonderful spring weekend! I often have issues with bananas too, so have made banana bread a few times to use them up and it's so yummy. Plus you can pretend it's healthy! I've not tried making macarons yet, but there's a good recipes on the Claireabellemakes blog that has really clear instructions. Good luck! C'est un plaisir de page en page, j'aime beaucoup votre univers, bravo pour les photos.